Many methods have been reported on improving the photogenerated cathodic protection of nano-TiO2 coatings for metals. In this work, nano-TiO2 coatings doped with cerium nitrate have been developed by sol–gel method for corrosion protection of 316 L stainless steel. Surface morphology, structure, and properties of the prepared coatings were investigated by X-ray diffraction, X-ray photoelectron spectroscopy, scanning electron microscopy and energy dispersive X-ray spectroscopy. The corrosion protection performance of the prepared coatings was evaluated in 3 wt% NaCl solution by using electrochemical techniques in the presence and absence of simulated sunlight illumination. The results indicated that the 1.2% Ce-TiO2 coating with three layers exhibited an excellent photogenerated cathodic protection under illumination attributed to the higher separation efficiency of electron–hole pairs and higher photoelectric conversion efficiency. The results also showed that after doping with an appropriate concentration of cerium nitrate, the anti-corrosion performance of the TiO2 coating was improved even without irradiation due to the self-healing property of cerium ions. The applications of TiO2 coatings for photocathodic protection of steels under ultraviolet (UV) illumination have attracted considerable interest because of their unique optical and electrical properties [1–7]. The principle of photocathodic protection lies in the fact that when a metal coated with a thin TiO2 coating is exposed to UV irradiation, electron–hole pairs are generated in the TiO2 coating . The photogenerated electrons transfer to the metal substrate thereby making its electrode potential more negative than its corrosion potential. Especially, in this photoelectrochemical anticorrosion system, the TiO2 coating functions as a non-sacrificial anode when used for cathode protection of steel. However, the practical application of this technology has been somewhat limited due to the high recombination of photogenerated e−-h+ pairs. Meantime, the pure TiO2 coating cannot provide photogenerated cathodic protection in dark condition. To solve the above-mentioned problems, there have been a number of studies related to doped TiO2 with materials such as WO3[9–12], SnO2[13–15], MoO3, phosphotungstic acid , and Ni(OH)2. The semiconductor with a different energy level from TiO2 can store excess electrons during irradiation. Subsequently, the stored electrons can be released in the dark, thus maintaining a more negative potential and offering a cathodic protection. However, this protection system cannot work well during a long-time dark condition. Thus, the investigation of the TiO2 coating as protective materials for steels without the photo effect is of considerable practical interest. Up to now, there are few reports on the corrosion behavior of the modified nano-TiO2 coatings without photo effect. In 2007, Yun et al. have revealed that N-doped TiO2 coatings show a remarkable improvement in corrosion protection without the photo effect due to their compact structure and hydrophobic property . In order to combine the photogenerated cathodic protection performance and the self-protection of TiO2 coating without the photo effect, it is highly required to find a new approach to improve the TiO2 coating as an excellent protective coating for metals. Herein a sol–gel method is used to modify nano-TiO2 coating with cerium ion by adding the concentrated solution of cerium nitrate. The cerium ion-doped TiO2 coating is taken into consideration for two reasons; on one hand, the Ce-doped TiO2 has widely been used as a photocatalyst to enhance the photocatalytic activity of TiO2 in the visible region [20–22] because it yields a large red shift compared to pure TiO2 and suppresses electron–hole recombination with electron trapping at Ce4+. We make use of this advantage in the field of photocatalysis to verify its improvement in the photogenerated cathodic protection for metals. On the other hand, cerium nitrate is known as a corrosion inhibitor in an aqueous aggressive medium. The corrosion inhibition properties of cerium nitrate have been widely discussed in literatures [23–25]. It is generally accepted that cerium ions lead to the precipitation of cerium oxides or hydroxides that suppress the corrosion reactions in the defects. Moreover, the incorporation of corrosion inhibitors into the sol–gel films can improve the protective ability of the coatings [26, 27]. We expect that the cerium ions doped in the TiO2 coating can also enhance the self-protection property of the coating based on its self-healing effect without photo effect. All reagents were purchased from Chinese Chemical Reagent Company (Tianjin Xibeier International Co. Ltd., Tianjin, China). The cerium ion-doped TiO2 sol was prepared by a sol–gel process with the following procedure: tetra-n-butyl titanate (Ti(O-n-Bu)4) used as titania precursor was added into the mixture solution of ethanol (EtOH) and triethanolamine (TEA) at room temperature, which was denoted as solution A. The molar ratio of EtOH: TEA was 23:1. Ce(NO3)3·6H2O was dissolved in H2O and then mixed with EtOH, denoted as solution B. The molar ratio of Ti (O-n-Bu)4:H2O was 1:9, and H2O:EtOH was 1:2. Then solution B was slowly added into solution A under vigorous stirring. Later, acetylacetone was dropped into the mixed solution with further stirring for 3 h at room temperature. The obtained transparent sol was aged for 4 days before using. The sols with different cerium ion content were prepared according to the nominal atomic ratio of Ce/Ti, such as 0.2%, 1.2%, and 2.2%. Besides, the pure TiO2 sol was also prepared for a comparison. 316 L stainless steel sheets were used as the metal substrate. Before coating, the surface of the metal was ground with grade 400–2000 emery papers gradually, then degreased in acetone, ethanol, and distilled water for 10 min, respectively. The coating was formed on the steel substrate by the dip-coating method. Firstly, the 316 L stainless steel sheet was immersed in the sol for 3 min and withdrawn at a speed of 12 mm/min. After natural drying in an air flow, the sample was dried in the oven at 100°C for 10 min. In order to obtain coatings with different thickness, the above-mentioned operation was repeated for several times. Then the sample was heat-treated in a muffle furnace at 250°C for 30 min, and at 500°C for 60 min. Finally, the coated sample was immersed in boiling water for 10 min, and thermally treated in the muffle oven again at 500°C for 10 min to eliminate the crack defects in the coating. 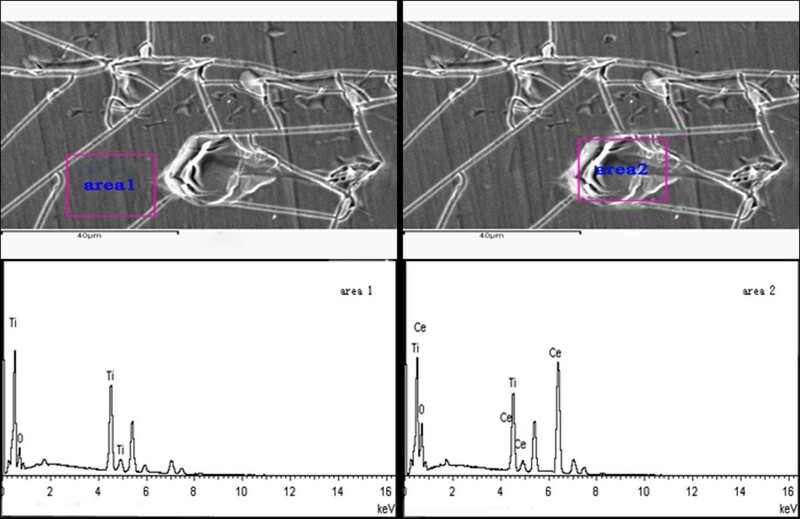 The crystal structure of the Ce-TiO2 coatings was characterized by X’ pert pro X-ray diffraction system (PANalytical BV, Almelo, The Netherlands) with Cu radiation (λ = 1.5406 Å) at a scanning rate of 1° min−1 for 2θ ranging from 10° to 80°. The X-ray photoelectron spectra were obtained with a Multi Lab 2000VG spectrometer (VG Thermo Scientific Ltd., East Grinstead, UK) using 300 W Mg Kα radiation. The air pressure in the vacuum chamber was below 10−8 Pa. The binding energy was corrected by taking the C 1 s level as 284.8 eV. Quantitative analysis was carried out using the sensitivity factors supplied with the instrument. The surface morphology of the sol–gel coatings was studied by scanning electron microscope (SEM) using LEO 1530 microscope (LEO Electron Microscopy Ltd., Cambridge, England) with 15 kV accelerating voltage of electron beam. Elemental chemical analysis of the coatings was performed by energy dispersive x-ray spectroscopy (EDX) connected to the SEM. Each electrochemical experiment was performed at room temperature in 3 wt% NaCl solution in an electrochemical cell equipped with a quarts glass window by using PAR2273 electrochemical measurement system (EG & G Inc., Akron, OH, USA). The test cell included a saturated calomel electrode as the reference electrode, a platinum counter electrode, and the Ce-TiO2-coated 316 L stainless steel used as the working electrode. The working electrode was embedded in epoxy resin and only remained an exposed area (0.25 cm2) for testing. A 500 W Xe lamp was used as the light source to simulate the sunlight illumination. 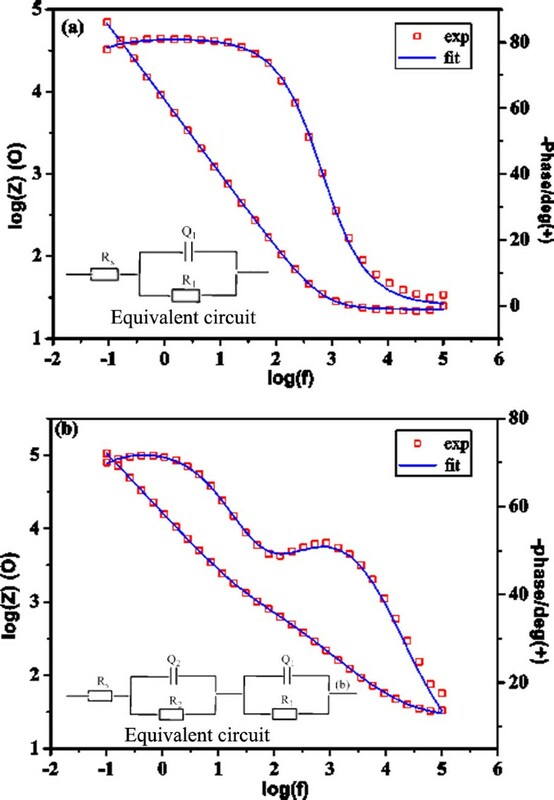 The variation of the open circuit potential (OCP) and the polarization curves were investigated in the presence and absence of light illumination. The Tafel curves were measured between ±250 mV at the open circuit potential at the rate of 1 mV/s and started after 30 min immersion of the samples in the NaCl solution. The electrochemical impedance spectrum (EIS) was measured with a frequency ranging from 0.1 up to 100 kHz, amplitude 10 mV at OCP. The impedance plots were fitted using Zsimpwin software (EChem Software Company, MI, USA) with compatible equivalent circuits which simulated the corrosion behavior of the coated metal. All the experiments were carried out in a Faraday cage to avoid external electromagnetic interference. Firstly, the influence of coating thickness on photogenerated cathodic protection for the metal substrate has been studied. Figure 1a describes the variation of the OCP for 0.2% Ce-TiO2 coating samples with different coating thickness. It is shown that under illumination, the OCP drops immediately to a more negative value than the corrosion potential of 316 L stainless steel (−180 mV). The metal substrate is maintained under a photogenerated cathode protection condition, which is caused by the sudden creation of photogenerated electron–hole pairs in the cerium ion-doped TiO2 coating. After a while, the OCP shifts slowly and tends to have a relatively steady value, owing to the balancing rate between creation and deletion of photogenerated electrons. As coating thickness increases, the stable potential negatively shifts. It is obvious that the OCP for the three-layer sample reaches the most negative value. Since the adsorption of photons by the Ce-TiO2 coating increases with its thickness, it is saturated when the coating is thicker than the light penetration depth. So the Ce-TiO2 coating with three layers exhibits the highest photoelectric conversion efficiency. After the illumination is stopped, the OCP of each sample rises quickly and coatings cannot provide a cathode protection for the metal substrate. Variation of the OCP. At (a) for the 0.2% Ce-TiO2 coatings with different layers under illumination, (b) for the three-layer Ce-TiO2 coatings with different cerium ion contents under illumination, and (c) Tafel curves of pure TiO2 coating and 1.2% Ce-TiO2 coating under illumination and in the dark. Line a: 1.2% Ce-TiO2 in the dark, line b: pure TiO2 in the dark; line c: 1.2% Ce-TiO2 under illumination; line d: pure TiO2 under illumination. Secondly, the effect of cerium ion doping content has been investigated. Figure 1b shows the variation of the OCP for three-layer Ce-TiO2 coatings with different cerium ion contents. It is displayed that the OCP negatively shifts initially, and the metal substrate is maintained under a photogenerated cathode protection condition. When the light is turned off, the OCP rises quickly in a few minutes and reaches to a value more positive than the corrosion potential of 316 L stainless steel. It cannot retain the cathode protection in the dark. Compared to the undoped TiO2 coating sample, the doped samples reach a more negative photopotential under illumination. The results indicate that cerium ion doping can improve the photogenerated cathodic protection of nano-TiO2 coating. Moreover, it can be seen that an optimal cerium ion doping content exists, which is the 1.2% Ce-TiO2 coating sample. 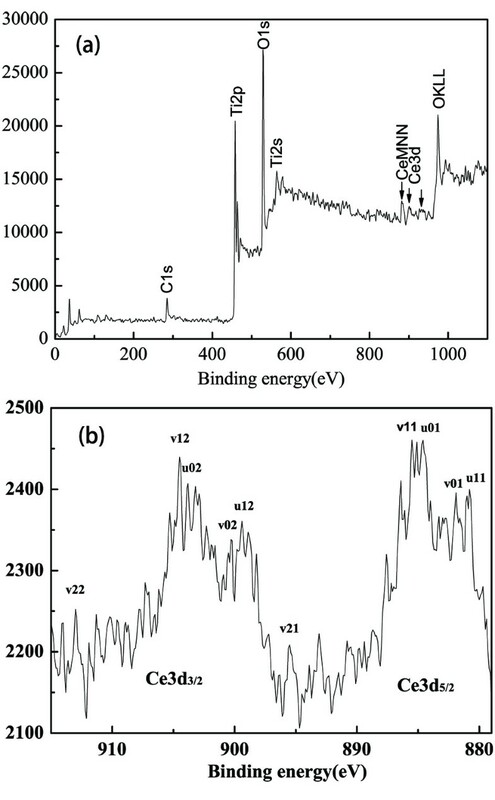 The effect of cerium ion on improving the photogenerated cathodic protection property of nano-TiO2 coating is discussed in the section of X-ray photoelectron spectroscopy (XPS) analyses for more details. Figure 1c shows the polarization curves for pure TiO2 and 1.2% Ce-TiO2-coated 316 L stainless steel in the presence and absence of light illumination in 3 wt% NaCl solution. The polarization curves of cerium ion-doped TiO2 coating shifts to more negative values under illumination in comparison with that of pure TiO2 coating. This phenomenon conforms to the variation of OCP for both samples, which has been explained in the former discussion. In the presence of illumination, the anodic current for each sample becomes higher than in the dark, which is due to the photogenerated electrons excited from the coating to the metal substrate. Compared with the undoped coating, the Tafel curve for the doped coating exhibits a positive corrosion potential in the absence of illumination, which can be correlated with the higher corrosion resistance of the coating. Moreover, the 1.2% Ce-TiO2 coating displays a much lower anodic current as compared to the undoped coating in the dark condition. It is proved that cerium ion-doped TiO2 coating provides an enhanced corrosion protection either under illumination or even in the dark. Survey spectrum for 1.2% Ce-TiO2 coating shows the presence of Ce, C, Ti, and O, which is depicted in Figure 2a. 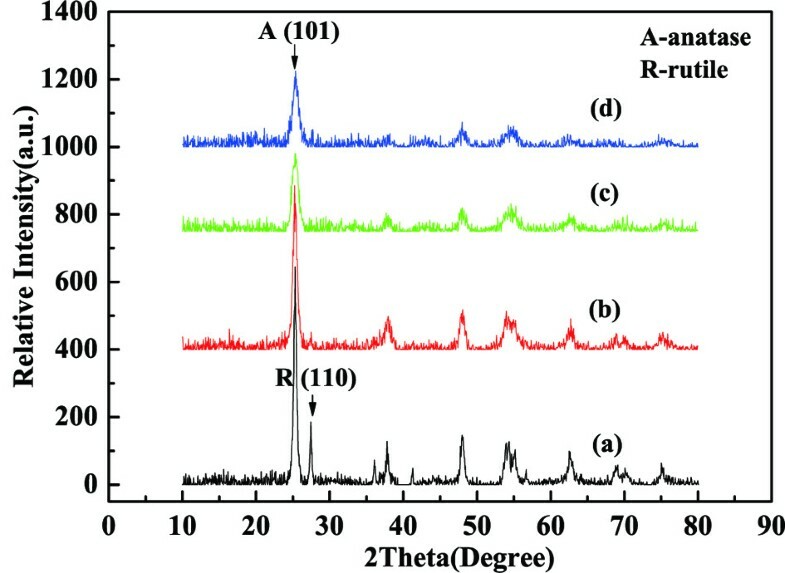 The Ce 3d XPS spectrum of 1.2% Ce-TiO2 coating sample is shown in Figure 2b. The spectrum basically denotes a mixture of Ce3+/4+ oxidation states giving rise to several peaks, indicating the coexistence of Ce3+ and Ce4+ in the coating. XPS spectra of (a) 1.2% Ce-TiO 2 coating and (b) Ce 3d region for 1.2% Ce-TiO 2 coating. KLL and MNN are the Auger group for O and Ce, respectively. Based on the spectral literature [28, 29], the Ce 3d spectrum is rather complex and can be assigned 3d3/2 spin-orbit states and 3d2/5 states. The peaks labeled ‘u’ and ‘v’ corresponded to Ce3+ and Ce4+ in ceria, respectively, in which the v01, v11, and v21 at 881.9, 886.4, and 895.5 eV represented Ce4+, while the u01 and u11 at 885.5 and 880.8 eV represented Ce3+ in the Ce 3d5/2 spin-orbit split doublet. Correspondingly, the v02, v12, and v22 at 899.4, 904.5, and 913.0 eV represented Ce4+, while the u02 and u12 at 902.9 and 898.2 eV represented Ce3+ in the Ce 3d3/2 spin-orbit split doublet. The Ce4+ ion is superior in the capability of trapping conduction band electrons under irradiation, and then forms its reduced state Ce3+. Moreover, the electrons trapped in the Ce4+/Ce3+ site are subsequently transferred to the metal substrate thereby making its electrode potential more negative than its corrosion potential. So the Ce4+ can act as the scavenger of electron and influence the photogenerated cathodic protection property by suppressing the recombination of the electron–hole pairs. However, it becomes the recombination center of electron–hole pairs when cerium ion-doped concentration increases further, because doping concentration also affects the thickness of the space charge layer (W). With an increased doping concentration, the space charge layer gets narrower. Therefore, the electron and the hole can be separated efficiently, and the lifetime of the photogenerated electron–hole pairs gets extended. When the cerium ion doping concentration is lower than the optimal concentration, the photogenerated electron–hole pairs cannot be separated most efficiently because there are not enough traps to capture the photo-induced electron. Only if the value of W approximates that of the penetration depth of the light into the solid, all the photons absorbed generate electron–hole pairs that are separated efficiently , and considerable electrons can finally be transferred to the metal substrate, making the photopotential reduced to the most negative value. Consequently, it is understandable that an optimal cerium ion doping content exists, which has also been shown in the section of photopotential variation with time. Where ε is the crystal lattice aberrance, d the space between crystal faces, Δd the error of the space between crystal faces, β the peak width at half height of diffraction peak, and θ is the half diffraction angle. XRD spectra of different Ce-TiO 2 coatings. (a) pure TiO2, (b) 0.2% Ce-TiO2, (c) 1.2% Ce-TiO2, and (d) 2.2% Ce-TiO2. 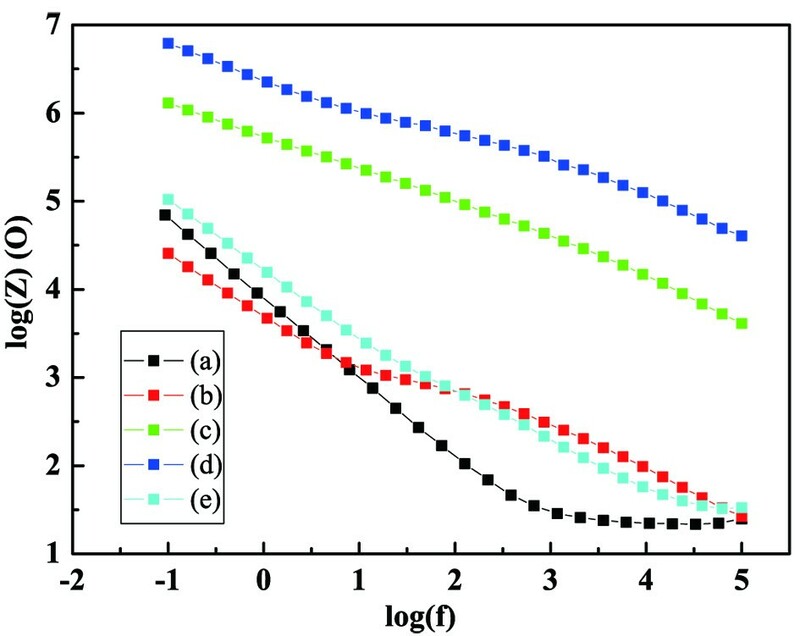 The results depicted in Table 1 revealed that due to doping with cerium ion, the crystal lattice expansion could suppress the growth of anatase microcrystal and thereby, the crystallite size was decreased. The degree of crystal lattice aberrance was also enhanced with the decreasing of the crystallite size, resulting in the creation of oxygen vacancies which could be act as the scavenger of holes. So doping with cerium ion could reduce the recombination of electron–hole pairs and improve the photogenerated cathodic protection property. Figure 4 presents the SEM micrograph of the 316 L stainless steel coated with pure TiO2 film, 1.2% Ce-doped TiO2 film and 2.2% Ce-doped TiO2 film. The surface of the undoped coating contains some cracks and also a few pinhole-like defects because of the shrinkage occurring during the thermal treatment. The sample doped with 1.2% cerium ion content seems to be more uniform and crack-free. It is believed that after doping with cerium in the TiO2 coating, the growth of the crystal is restrained, and therefore, the size becomes much smaller and the distribution of the nanoparticles gets more even and compact. It can be inferred that the cerium ion-doped TiO2 film offers a more efficient protection for the metals as result of its smooth and uniform surface. The 2.2% Ce-doped coating has some cracks but fewer defects. It was attributed to the presence of too much cerium content in the coating. SEM images of different Ce-TiO 2 coatings. (a) pure TiO2, (b) 1.2%Ce-TiO2, and (c) 2.2%Ce-TiO2. EIS was used to study the effect of cerium ion doping on electrochemical properties of the TiO2-coated 316 L in the absence of illumination. Figure 5 shows the impedance spectra of the bare 316 L and the coated 316 L samples after 7 days of immersion in the 3 wt% NaCl solution without photo effect. EIS spectra for different Ce-TiO 2 coatings after 7 days of immersion. (a) bare 316 L, (b) pure TiO2, (c) 0.2%Ce-TiO2, (d) 1.2%Ce-TiO2, and (e) 2.2%Ce-TiO2. It can be seen that 1.2% Ce-TiO2 coating exhibits the highest impedance values. By comparison, the impedance magnitude of 2.2% Ce-TiO2 coating decreases significantly after immersion, offering very little protection and behaving in a manner very similar to that of the uncoated sample. In order to get more detailed analyses of the corrosion protection properties attributed to different coatings, the impedance spectra were fitted using the appropriate equivalent circuit models, which were shown in the inset of Figure 6. The fitting curves for the impedance spectrum of bare 316 L and the coated 316 L were plotted as depicted in Figure 6, on which an excellent agreement between the experimental data and the theoretical curves can be obtained. After 7 days of immersion, the impedance spectra show two typical time constants for the coated 316 L and only one time constant for the bare 316 L. Adopting the usual interpretation employed for coated metals, the time constant in the high frequency region is attributed to the sol–gel coating properties, and a pair of elements of R2 and Q2 in parallel represents the resistance and constant phase element (CPE). Here, CPE is commonly used to replace capacitance because it is hardly pure capacitance in the real electrochemical process and it is defined by admittance Y and power index number n, given by Y = Y0 (jω) n . This is a general dispersion formula, for n = 0 it stands resistance, while it is capacitance if n = 1. In all cases of the study, n is close to 1, representing a capacitive characteristic of the interfaces. The time constant at low frequency region is related to the properties of passive film present on the stainless steel surface, and a pair of elements of R1 and Q1 in parallel represents its resistance and CPE. This oxide film may be formed naturally and also results from the reaction with the solution, which penetrates the outer coating after long-time immersion. As for the bare stainless steel, the time constant can be attributed to the response of the passive film formed on the 316 L and Rs is the resistance of the solution. Table 2 presents the corresponding electrochemical parameters obtained in the equivalent circuit. Usually, the uniform and thick coatings behave as an insulator with high resistances and low capacitances. It can be seen that the resistance in the high frequency region (R2) of 1.2% Ce-TiO2 coating is almost two orders of magnitude higher than that of undoped coating indicating a reduced accessibility of electrolyte due to its compact structure which is in agreement with the results from SEM observation. By comparison, 2.2% Ce-TiO2 gives lower coating resistance and higher capacitance. This means the corrosion protection property is not always proportional to the doping cerium content. It can be inferred that there is an optimum concentration for beneficial effects of cerium ion on corrosion resistance, while higher concentration of cerium ions in the sol–gel coating leads to the formation of a fragile film with poor barrier properties. Increase in the amount of cracks and defects in the sol–gel layer seem to be mainly responsible for this negative effect. Moreover, it is obvious that the resistance in the low frequency region (R1) of cerium ion-doped coatings is almost one or two orders of magnitude higher than that of the undoped coating, confirming higher corrosion protection for the substrate. The protective role of Ce ions is attributed to the precipitation of cerium hydroxides and oxides in the cathodic areas of the passive film. Such species can block the cathodic sites hindering the cathodic reaction and consequently, the corrosion rate. SEM-EDX is tested after EIS analysis in the 3 wt% NaCl solution. As can be seen from Figure 7, the cerium ions do not have a homogeneous distribution, and the Ce content is higher in the defect (marked with area 2) compared to that exists in the compact area (marked with area 1). The reason is the release of hydroxyl ions in the cathodic areas around the defect which leads to the precipitation of cerium hydroxides and oxides. The phenomenon further demonstrates some kind of self-healing effect provided by cerium ions in the specific areas. EIS-EDX analysis of 1.2% Ce-TiO 2 coating after EIS test in 3 wt% NaCl solution. Area 1 and area 2 on SEM micrographs mark the compact area and the defect of the coating respectively, where EDX tests were performed. We have successfully prepared the smooth and compact cerium ion-doped nano-TiO2 coating on the 316 L stainless steel by the sol–gel and dip-coating techniques. The photogenerated cathodic protection property of the TiO2 coating is enhanced because of the higher separation efficiency of electron–hole pairs and higher photoelectric conversion efficiency obtained by doping with an appropriate amount of cerium ions in the coating. The 1.2% Ce-TiO2 coating with three layers exhibits the best photogenerated cathodic protection in the 3 wt% NaCl solution. Furthermore, the presence of cerium ions also improves the corrosion protection property of the nano-TiO2 coating without the photo effect attributed to the inhibiting and self-healing properties of cerium ions. The results reveal that there is an optimum concentration of cerium nitrate around an atomic ratio (Ce/Ti) of 1.2% for the coating with the best corrosion protection performance in the dark. The higher concentration could increase the amount of cracks and defects in the sol–gel layer and lead to a negative effect in the barrier properties of the coating. Consequently, the cerium ion-doped nano-TiO2 coating can not only provide a better photogenerated cathodic protection to a metal substrate in the presence of illumination but also act as a better anticorrosive barrier in the absence of illumination. The authors are pleased to acknowledge the financial support provided by National Natural Science Foundation of China (51102135), Natural Science Foundation of Jiangsu Province, China (BK2011711) and Nanjing University of Science and Technology Research Funding, number 2011ZDJH24. The work presented here was carried out in collaboration between all authors. SNL carried out the laboratory experiments and wrote the paper. QW and YW interpreted the results. TC analyzed the data and participated in the revision of the manuscript. ZHZ helped in drafting the manuscript. JJF designed methods and defined the research theme. All authors read and approved the final manuscript.